McCalls 5978: Misses Cardigans & Top: Cardigans have three-quarter or full length sleeves and stitched hems; cardigan A has purchased lace trim; cardigan B has jewel stones; cardigan C has pearls; cardigan D has self-fabric appliques; sleeveless top E has narrow hem finishing at neck, armhole and lower edges. Did it look like the photo/drawing on the pattern envelope once you were done sewing with it? Close enough. Were the instructions easy to follow? Very sew friendly. What did you particularly like or dislike about the pattern? There is nothing to dislike... I like the simplicity of the set. I tried my hand at a blind hem, which worked ok for the most part, however, I had a hella time with the needle sinking into the end of the hem line, there was so much bulk due to the bias trim and had to finish off by hand. The shell was a breeze, one pattern piece to create the front and back. Pattern Alterations or any design changes you made: I did not do any of the lace or gem embellishment and opted out of the 5 buttons, instead used an antique clasp. I enclosed the facing with red bias trim instead of serging. Would you sew it again? I will definitely sew it again and highly recommend it for anyone looking for an ensemble that fits into any wardrobe. Conclusion: A great set to spice up any garment that has been lingering around waiting for the right pairing. Boy are you fast! I'm still dancing around that pattern and you have one made up already...beautiful color and great twinset! 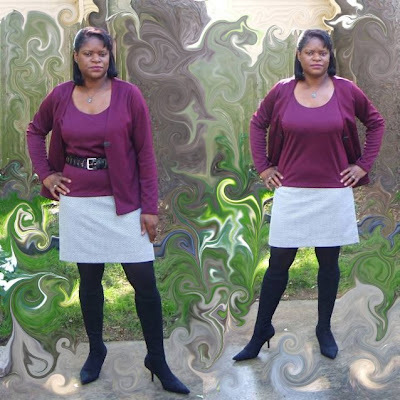 Nice twinset...I have this pattern so maybe I will make it it this fall too since yours turned out so well!!! Such a pretty twinset. Where did you get your fabric? @ Carolyn... I normally cut the patterns in the begining of the week and during the week spend the day/night sewing. @ Lori... I purchased the fabric from JoAnn's, during one of their 40% off sales. I just bought this pattern Saturday, yours looks much better than the pattern, love the clasp , that's a great color on you. Wow I really like that Sheila. I love the classic look of twin sets. I have the pattern and some burgundy ponte knit so I will be copying you. Lovely twinset. I have the pattern. The fabric was perfect. I love your twin set,you sew so beautiful. This is what my goal was back in August. I have not sewn anything since then. I have brought some fabric and cut it out. I have yet to sew the pieces together. Go figure. You already know I like the purp and the heather together. The tights and feet set off the look. Nice chica!! I really like this sort of practical garment. Looks great with the skirt and tights and is beautifully made. Perfect for fall! It looks really versatile, like you can pair with a skirt, pants, dress, etc. Good job! Great set. I'm putting this pattern on my list to pick this week. Very nice and that really was quick ! I love that you made a coordinating top. Very classy. Great work! I love easy casual clothing that goes with so much! You'll get much wear out of this!! Great twinset. Perfect for the fall weather. The clean lines make for a versatile set to be paired with a variety of bottoms. Looking good as always. I just LOVE that color you used!!! You picked the perfect color! I know others have said the same, but seriously - fabulous. Lovely. I like the wrap dress with the sash. I think it could work with a lot of figures. Have you made anything lately for the flight attendant? I wore it and the wearability was great. I still have the pattern pieces tape to the wall to inspire me to work up another one. @ Syl - I finally purchased the fabric to make her pants & skirt, but she hasn't been home long enough for us to collaborate on fitting issues. Where are you - been missing you. Hope all is well! Great set! I'm glad I stumbled upon your blog!